Doors for closets are made of aluminum or steel frame profiles. In the frame insert, chipboard, glass, rattan, mirror, plastic, leather or a combination of materials. Decorate the door immediately when ordering a wardrobe. If the decor was not provided, you can do it at any time. As decoration for the doors of the wardrobe can be use engraving, sandblasting drawing, inserts of coloured glass, photo printing, stained glass Windows. Via printing furniture can be decorated for any taste: to give the door the appearance of real wood, to represent a waterfall, and other elements to your taste. With the help of a special stencil and water-resistant paint you can decorate almost any material, including glass and mirrors. Way to use photo printing is quite simple, attach to the door of the wardrobe a stencil, paint the voids of the desired colors, allow to dry for several hours, carefully remove the stencil. With laser engraving you will be able to give the doors of the wardrobe original. Buy a special device, put picture, and it will do engraving. If you do not plan to spend money on a laser engraver, use the services of specialists. The doors of the wardrobe can be removed without any problems and take a workshop. Sandblast pattern is the decoration of furniture with the help of a special apparatus. High pressure on wood, glass or other materials is fed a stream of sand and use it to inflict any drawings from the simple patterns to intricate shapes and patterns. Decorate the door from the closet at a specialized workshop. Insertion of stained glass is the decorative elements that are made in different ways. The most affordable form of decoration for doors from sliding wardrobe – sticking special sheets made according to the technology "fusing". Stained glass items are sold of all sizes with drawings for every taste. Stained glass window film – sticking on the door of the pieces of color film. The cost of one square meter of decorative stained glass is from 3 to 12 thousand rubles. The most difficult – contour stained glass is made on the CNC machine. 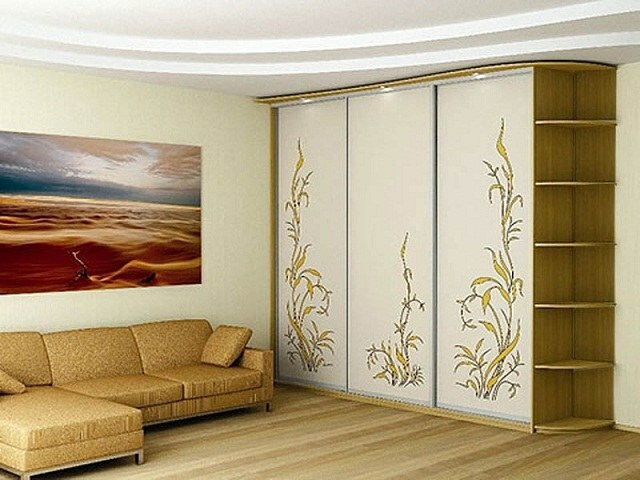 Computer processing of the picture allows to make the decor of the doors of the wardrobe to suit any taste for a very reasonable price.